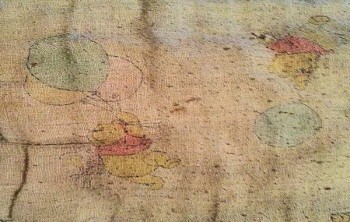 I’m looking for a cotton 1998 Winnie the Pooh and Piglet crib blanket that came with sheets and a dust ruffle. It had Pooh and Piglet holding balloons. 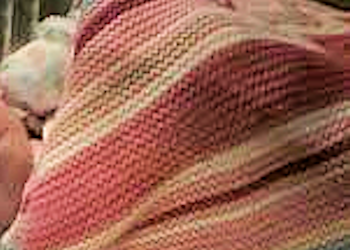 I’m looking for a 2010 Hooray Cynthia Rowley Prep Up pink striped knit sweater material baby blanket, originally sold at Babies ‘R Us. I’m looking for a 1994 white baby blanket with pastel/neon baby objects on it like safety pins, rattles, and baby bottles, from 1994 or possibly earlier. I’m looking for a 1980’s Fisher Price ruffled cream bears blanket with blue stripes and toy soldiers, rabbits, bear dolls, stars and a house in the print. 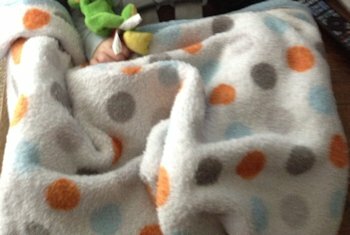 I’m looking for a 2011 Just One You white baby blanket with large blue, gray and orange dots purchased at Target with light blue trim. 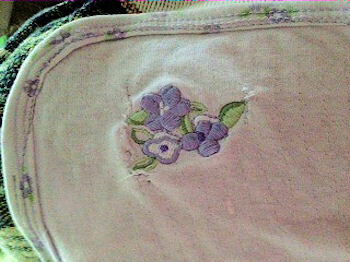 I’m looking for a 2006 Carter’s lavender baby blanket with small purple flowers around the thin border and purple and green embroidered flowers in a corner.